EXPIRES 6/2018 - Promotes Protein Synthesis! Prevents Muscle Breakdown! 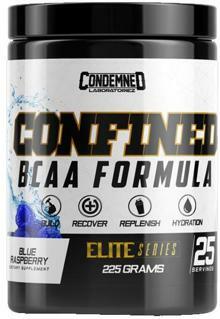 BCAA’S consist of 3 essential amino acids; L-Leucine (the most anabolic), L-Isoleucine and L-Valine. These amino acids are directly responsible for building and repairing muscles via protein synthesis. For people who train consistently, they need more of these amino acids to keep the muscles in an anabolic state. CONFINEMENT was formulated with a proven 2:1:1 ratio to make sure your body receives the proper amount of these BCAA’S. We’ve aggressively added metabolites of L-Leucine; HICA and HMB to heighten the benefits of building lean mass, while including Arginine Alpha Ketoglutarate (AAKG, the highest, most absorbable form of L-Arginine) to open pathways for faster travel to the muscles. To maintain hydration and prevent cramping we’ve included an electrolyte complex along with Sustamine. Sustamine enhances electrolyte and water absorption in the intestines, it also inhibits muscle protein breakdown and promotes the synthesis of muscle protein. This formula is complete as your all in one for repair, recovery and replenishment!